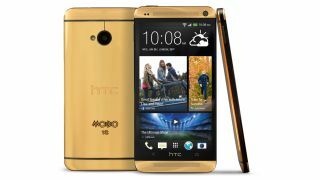 Meet the most expensive smartphone HTC has ever produced; the 18ct, £2,750 (around $4,400, AU$4,700), limited edition Gold HTC One. If you've got a large wad of cash burning a hole in your pocket and fancy getting your mitts on one of these then you're out of luck as only five actually exist and one of those is already reserved for the winner of Best Newcomer at the MOBO Awards. We've seen the iPhone 5S and Galaxy S4 turn up in gold hues recently, but HTC has taken things a step further with its gold plated One. We're sure the kids will agree this One is totes #swag. #YOLO. We've got our own limited edition offering here at TechRadar - our awesome (but sadly not gold-plated) blips.